Finally. We've wanted to do this race and this year we get to. It's two 24-mile loops with 1 significant climb in the middle. My sister, Tracy, is baby sitting the kids so both Robin and I can race. We've been very busy lately and behind on sleep and training so really hoping not to get dropped from the pack. I haven't planned things well lately and in the same fashion I begin the race with no gloves, no gel packs, and no pre-ride of the course. The nice thing about 2 loops is being able to scout out the course the first time around. Fellow Victory Velo teammates, Walt and Randy are in the group of 50 riders. I'm glad to have friends in the blue-and-white. Also, my friend Vince Hoffart is next to me and gives me insight on the race and some of the other riders. We head out of town and I'm near the back. After the neutral section, the official pulls off and we on our merry way. It is a merry pace. Calm. Slow. I think everyone wants to remain fresh for the hill. Right after I think, "maybe I shouldn't be this far back because of crashes.." someone clips a wheel 3 bikes ahead and goes down, taking another guy with them. Thankfully I was able to just get around them and the riders weren't hurt either. Finally I get farther to the front and make some conversation with some other riders. I go to the front a couple times but very short, just feeling it out. I'm also trying to conserve and not get frustrated with the slow pace. My plan is to ride up the hill well and then use my descending skill to bridge up to join any break-away. We start climbing a little and weaving in and out of the small canyons. It's a good course. After the feed zone, the climbing gets steeper. Then it gets real steep at a switchback. I'm thinking this may continue for another mile but I'm glad to see that was it! We're over the top and only 1 guy is ahead of me. I pass him as he slows and I dive into the first turn. The next turn is a left hair-pin, like descending Shirland Tract Rd back in Auburn. I'm happy with my quick line through the hair-pin and now that I've seen it, feel I can go even faster the next time. The rest is gradual and I soon turn onto a main road that is flat again. I got ahead about 10 secs on the main pack which is a great confidence builder. The hill didn't seem as hard as I expected. I re-group with the pack and it feels like we're all together, but I don't see Vince. I'm hoping he's ok. The road is smooth and the pace mellow. Another group is passing us so the official puts up a red sign to put us in neutral so that the other group can get past and well away before we get back to racing. I'd used the bathroom before we started, but immediately I had to go again. I'd been wondering what to do and now I had my chance. I'd seen the pros do it in the Tour de France… go to the back, turn sideways… you can figure out the rest. It works! But I see the red sign change to green and just catch back up in time before the group gets away. I don't even know if that's legal but for some reason I feel more like a real cyclist now. I look down and see my front tire getting soft. That is the one scariest thing I could imagine going into a technical descent. A flat back tire only causes a skid-out and road rash on the hip. A flat front tire causes a wash-out and a head-first crash. I broke a tooth one time when a soft front tire washed out on a downhill turn. A complete flat would cause me to stop and fix it. But it's a slow leak so gotta try to keep going. I really feel the Lord is with me in every race and the most important reason for even starting. I did say that my "whole focus" was on the downhill bomb… my main focus should be on the Lord. So when I saw my soft front tire and new the dangers ahead, it didn't surprise me but instead just seemed fitting. I just really felt it was God's plan, and I always learn better and more deeply from His plans over my plans. So I will do my best and see what happens. Almost to the steep switch-back, it's hot and I'm gasping. I'm in the lead but then 8 guys stand up and pass me and I can't respond. I'm maxed out. This hill seemed so perfect the first time but I'm humbled this time by the strength of the other riders. I can still catch them going down… maybe my tire is still good enough… maybe it's just an illusion that it's soft. Going into the left hairpin I slow a bit more on the approach. I'll just go 80% and see how the tire feels. In the middle of the turn I feel the dreaded sensation of the tire rolling off the rim. This is always a split second before the rim hits the ground and the bike instantly disappears beneath you. I immediately accept the fact that I'm going down. But in a sudden reaction, I correct just a bit, going a little wider and remarkably the tire snaps back and I come out unscathed. Thank you, Lord! You kept me up. The rest of the corners I take more cautiously, making sure not to get to the lean angle where the tire had started to roll. Because of this I go wider, almost crossing the centerline which is disqualification. By the time I get to the flat road, safe and sound, the 8 or 10 guys now ahead are in a breakaway and the chase pack is right behind me. Should I change my tire? At least inflate it with a cartridge? No time.. I jump onto the chase pack.. which is hard to do in the saddle. I can't stand and rock because the weight flattens the front tire. Teammate, Randy, is in the chase pack. He takes the lead and bridges the gap, bringing us back to the breakaway. I thank him and tell him I'll try to help him since I can't sprint at the end. As we continue on, 10 miles to go, I keep watching my tire. I pray that the Lord will keep it where it's at, or even miraculously make it inflate back to full.. nothing is impossible for God. With a mile to go, I'm still amazed the tire doesn't seem that low. I also see the pace is slow and threatening a large sprint group. So I lead for a bit to pick it up. As I move back I see Randy getting into a good lead position. At the same time I'm getting blocked in. I have to keep my line straight. The last thing I want to do is take out other riders if I fall. I want to get to front to help Randy but I can't. I see the 300m to go sign and start pushing just as the peloton does. I go as hard as I can while staying in the saddle and am surprised that I'm able to stay with the main group. Randy has a terrific sprint and ends up winning and I was able to get 9th! Wow, that was so cool! The low tire kept my mind off of all the dreaded anticipation of the "end game" and allowed me to simply ride hard to the finish. I thank the Lord that He allows me to have fun, exciting, rewarding races even when they may look like they didn't go well. After the race I measured my front tire at 45psi, compared to 120psi at the start. And then while cheering Robin to her fantastic 7th place finish, I noticed that my front tire was actually Robin's front tire which I mixed up when I unloaded the bikes. I'm so glad I had the tire leak rather than Robin. The descents are already scary enough for her. We both had a great day at Winter's. And we were excited that many Victory Velo teammates placed high! Troy and I have the privilege to race together while the girls are visiting with their cousins... thanks Aunt Tracy! This is a huge venue in cute downtown Winters! I've never seen so many cyclists crammed into such a small space! I thank the Lord that I was able to register on race day! Today I'm doing my 2nd road race and I feel a lot more confident than last time. This time the roads will be smooth. Also, my experiences hanging-on-for-dear-life in the intense local "Coffee Republic" ride has helped. I'm riding with over 30 ladies. I'll need to stay focused. The course is mostly flat with a nice climb half way through each loop. I hope my climbing has improved so that I can take advantage of it! Troy and I pray for safely and for each of us to have a good and fun race. I see Troy's group off and then wait for a few more groups to go. 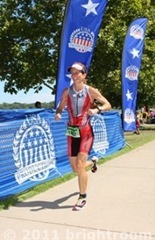 I chat with a Cal graduate, Sabrina, that is riding her first road race unattached. She's got some good racing experience so she is a good one to learn from. Here we go! We roll out of town with little fanfare. The group is cruising along. As we get further along, the front group seems to be jumpy or something because we have to suddenly pull on the breaks several times. I'm not sure what's going on up front! As we approach the climb, a group of men on their second lap come up on us with a moped in the lead. The moped pulls ahead of us and our group slows to a crawl. Someone asks if the moped is making our race neutral (or, for a moment, a non-race). Having no clue we all just try to be patient. We get going again as the moped disappears. The group starts to scatter as we ascend. I'm feeling strong and pass a bunch of girls and catch up to the lead girls. As we come down the other side, I'm being cautious because I'm unfamiliar with the terrain. Fortunately, I'm able to catch back up as the girls slow back down to cruise mode. There are about 15 of us now. Some of the girls try to get our group going by saying the other girls are catching us. Some say, "let's rotate pulling". But it doesn't seem to make a difference. So I pull out in front in hopes of getting something started. As I pull off, there is no interest from the pack to keep this up. I pull back into the group and continue to look for opportunities to encourage the group to organize and work together. Finally, 5 miles down the road a girl and I start to rotate and the group gets on board! Thanks God. We keep this going and get into a good rhythm. Suddenly a girl next to me hits the wheel of the girl in front. I'm certain she's going down, and some of us with her, but she amazingly recovers as she swerves out into the opposite lane...Praise God she stayed up right and that no cars were coming the other direction. I tell a San Jose Bike Club rider "thank the Lord she didn't go down" and she agrees. 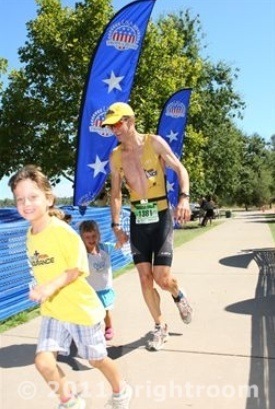 We chat a bit about our kids and the joy in being able to get out and do something like this. We make it to the hill again and this time I don't feel as strong. I pull away from some of the girls but 5 of them are ahead of me. They get further and further away but I'm hopeful I can catch them. As I reach the descent, I'm all alone. At the bottom, I time trial it to catch one girl in the distance. After a few miles, I can see a group of 3 girls catching me. I let them bridge up to me and we work together. Sabrina is in the group and the San Jose rider...good company. We start the rotation again. We are all from different teams so we know we need each other to make it to the end...and hopefully bridge the gap. It's clear with a mile to go that we are not going to catch the breakaway group. Now we are biding our time and wondering when to make a move. At 1K, nothing happens. At 500meters, nothing. I see Troy ahead and he's telling me something I cannot hear but I assume it's "go now". At that moment of hesitation the girls take off. I dig in deep and to my surprise pass 2 of the girls to take 7th place just behind Sabrina. Wow, thanks God! It was a fun race! Thank you for the protection out there for all of us too! My last triathlon of the season. 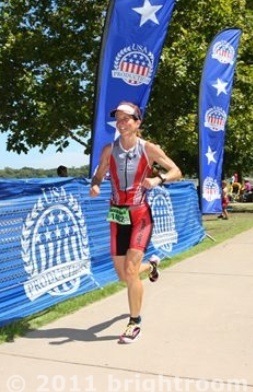 It's longer, but less than a 1/2 Ironman fortunately as I haven't been putting in the distance lately. We just got back from a family camping trip where I squeezed in something like a 9mi run just to make sure I can still do it. Although I'm a little tired from the trip, I'm looking forward to this new course and, again, will try to improve my bike by improving my seat position. Race director, Ryan Coelho, has again expanded the venue at a well-established race site. 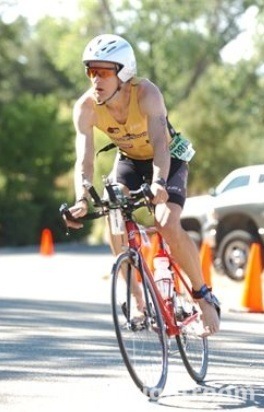 First, he added a long course to the San Jose Triathlon which toured some of the best cycling routes in the South Bay. 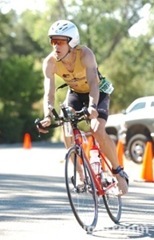 Then he boosted the Pleasanton Shadow Cliffs triathlon course into an official International Distance with a great bike route over the Sunol Grade. 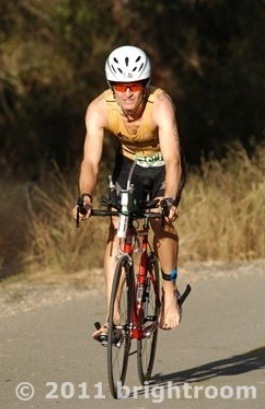 And now the Folsom Triathlon has a Long Course with 1 big loop to Elk Grove and back. It covers some of the same roads the Amgen Tour of California raced on. I love big loops. They are harder to support and harder to stay motivated on, compared to the multi-loops, but it's true time-trialing.. the race-of-truth, just you and the bike, touring rural areas, wondering where your competitors are… sometimes wondering where the finish is. Lake Natomas is perfect for swimming and the American River Bike Trail is a great out-and-back run course. Race morning. Robin and the girls are arranging the FCA Endurance booth while I adjust my bike seat and test it out. Ahh, feels good.. feels comfortable and powerful. The 56mi bike dwarfs the 1mi swim and 9mi run so it's important for me to stay strong all the way. Dale and Tana Jackson are in the house! Love racing with this legendary couple. Tana, the Energizer Bunny, will rock the course, with a smile, like usual, and Dale is going to make me hurt with his punishing-fast swim-bike-combo. He's one of my best friends, but he knows I want to beat him badly. I rush to the FCA Endurance pre-race prayer where Robin, the girls and some other folks are already beginning. It's always great hearing other's stories, concerns, and blessings coming into the race. There's so much more going on beneath the surface of each athlete out here, but when you see them all racing in a group, it easy to just think "triathletes" instead of real, average people trying to break barriers. My wave is starting soon but we have to move the booth location a bit. I don't hear the race getting underway so figure it's running a little late. I run down to the water, see Tana and Dale, and then see the start, 100yds away, with a bunch of green caps lined up. That's my wave! Then I see the first wave already underway. The loudspeaker had malfunctioned. They were on time, there just wasn't an announcement. Dale quickly zips my suit for me and I jump in as the horn blows. By the time I get to the starting line, a minute later, I can't see the main pack anymore. It's my fault but I can still have my best race today! I'll make it up on the bike. One of the advantages of starting late is clear sailing ahead - no bumping and crowding around the buoys. The disadvantage is no draft - easily a minute to gain - although I haven't been good at catching the drafts this year anyway. 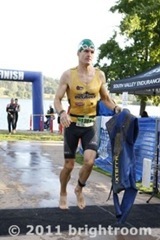 The other dilemma was not being able to fill my suit with water. It's restricting my arms. But on the other hand, it's warmer. Rounding the buoys for the long stretch back, there are cold-pockets out here in the deeper sections. I hope not get too cold. If I can come out before the pre-shivers, I can ride without my jacket and save a minute in transition. I get to the somewhat-rocky shore and stumble out before getting too cold. Perfect! My wetsuit comes off pretty quickly, I high-5 Anna and Ariel. 28min isn't too bad for missing the start.Our good friend, Dave Campbell (racing tomorrow's International distance) is volunteering as transition coordinator. "Come on, Troy, get out there, let's go!" I always go faster with encouragement. Too fast. I jump on my bike. "Whoa, off the bike, not till the mount line!" Oops. Ok, ready to rock and roll. Perfect temperature. No wind. Feeling comfortable. 2 bottles of Sustained Energy. And a whole new bike course ahead. At 3mi I see they're holding up the light rail. They time it just right to drop the gates, let it pass, and open them up for me to go through. "Good timing, guys!" Heading out of town I'm looking forward to the flats and gentle rollers. My previous position was better for climbing. The nose-up position is better for flats. The one turn-around is at 8mi. It's good because it gives one last chance to see where the competition is. And there's Dale! Only a minute back after starting 4min back in the next wave. We turn towards Elk Grove and I finally get my average up to 20mph. I'm going to have to do better than that to stay ahead of Dale. My speed continues to creep up slowly. I feel like I'm riding better than my last few races. Meanwhile, I'm loving the roads…smooth pavement, rolling fields and no lights. But this is also Dale's perfect course - long sustained power. Earlier than expected, Dales catches me! "Man, bridging a 4min gap, and I'm having a good bike! You're riding great, Dale!" He's a great sport, all smiles and looking relaxed and efficient.. and strong. I pick it up. Match his pace. And make the pass. I yell, "You're fast but I can't let you win!" We're going 23 / 24mph. If I can get a gap maybe he won't challenge. But after a while he goes by again.. looking the same. Ah, this is good racing.. painful.. but good racing. I keep within a few hundred yards. Staying fueled with Sustained Energy. I make another big effort…exaggerating it with a yell, "AHHHHH!" as I muscle my way past him. It's friendly competition at it's meanest. But as we enter the outskirts of Elk Grove, he mimics me with an "AHHHHH!" of his own as he hammers by. This would be our own version of "Iron War" if it wasn't for the fact that he's actually 4min ahead of me. I need to finish with him and then somehow get back 4min on the run. However, at 30mi, he's pulling farther ahead. We're on Grant Line Rd.. straight and long. He's smaller and smaller in the distance. My average is 22.3mph but I'm feeling the fatigue. Maybe we're climbing. No. Maybe it's a head wind. No, actually it's very still today. I can still see Dale in the distance. He passed another guy who is now on his tail. Now the guy passes Dale and takes off, as if Dale said something to really light a fire under him. Finally we're getting closer to town. A guy passes me telling me he made a wrong turn back there. Later I heard a number of athletes went the wrong way. I don't know how, it was a pretty simple course. On the final overpass back to transition I think I see Dale ahead. That's strange. He's slowing down. 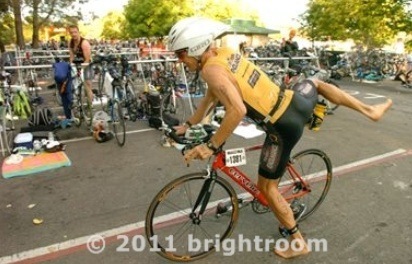 I finish my drinks, coast into transition, and make my best dismount yet.. full stride. My transition is very fast - again with Dave nearby encouraging me - but I forgot my Garmin watch and I was also without my Hammer Gels which I knew I had forgotten that morning. My plan was to get whatever was on the course. Starting the run, it hurts. Of course the 1st mile always does. 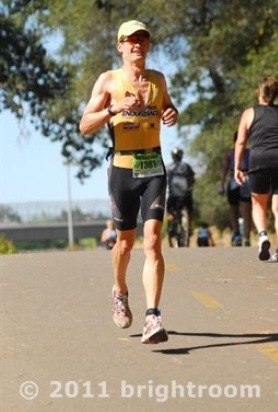 Mentally it seems easy.. just run up the trail to Old Town Folsom, turn-around, and it's all downhill home. I'm optimistic my legs will loosen up and the Lord will give me strength to overcome fatigue. 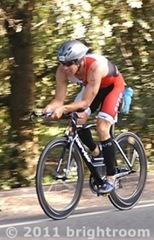 Ahead is Tom Murphey (currently 2nd place in my age group). Looks more like a biker than a runner so I think I can take him. I don't see Dale ahead, he must be running fast. Mile 1: 7:04. Mile 2: 7:04. After a couple miles, another 40yr-old is ahead, nursing calf cramps. He picks it back up and I encourage him. He surges ahead, but slows at the aid stations, where I re-pass him. My legs aren't feeling better and the heat and fatigue are getting to me. I'm drinking Heed and water at each aid station and pouring water on me as well. Mile 3: 7:06 The calf-cramp guy is back with a vengeance. I hear him matching my steps behind. I focus on the Lord to help calm me and run my own race. With footsteps so close, it can increase heart rate and shorten breathing. I stay relaxed as possible. I make a plan. At 4mi, surge to the turn-around, make a gap to break him. Mile 5: 6:46. Tom is back with me and my fatigue is building. Pace slowing. Tom goes by (I'm in 3rd now) and I can't match him. It's hot. The miles are getting longer. Mile 7: 7:41. I'm reduced to a jog. Another 40yr old goes flying by (I'm in 4th). I'm really struggling. New plan - use this as a warm-up mile before the final mile at the track workout. When I see the "8 Mile" marker, I'll pretend I'm at our Tuesday night track workout with just a final mile to go. My body says, "No, just make it 2 cool-down miles and be done", but I feel God wants me to make the effort. That this is always a practice for real life. I know when this difficulty will end so it should be easy to step it up when needed. In real life, trials don't have definite endings, but we have to step it up anyway. Use this as practice. Mile 8. 8:04. Ok, go! It hurts but I'm going. I'm making the effort and feel God may reward it with a clear opening at the end so that I can run in with the girls. Over the bridge. Onto the road. One last section onto the trails.. and there's the finish line! Anna grabs my hand. Ariel is already running ahead. Anna is running so fast I have the sudden desire to let her pull me to the finish. But that would be cheating so I keep pushing. Finally all 3 of us cross.